One of the big draws with cruising? It can be an affordable vacation that allows you to travel to distant ports, eat world-class food, and enjoy loads of entertainment for drastically less than you’d pay if you booked all these items separately. But truth be told, the costs of cruising can add up quickly. Between getting to the port to excursions to the actual cruise itself, the costs can add up, making budgeting more difficult. To help you out, we’ve created a cruise cost calculator. The calculator below offers a chance to estimate your expenses for your trip, with all the major spending areas you’ll find a cruise. Simply input details about your trip and see how much you should budget for your trip. Need more details about what amounts to put in certain fields? Read below to learn more about each section and what you might spend. You can’t start your trip without getting to the ship first. Transportation amounts vary depending on where you are coming from and which port you are sailing from. Assuming you are arriving at an airport, you’ll obviously spend the greatest amount to get to cruise ports farther away. Ports like Galveston and Port Canaveral are located far from the nearest airports and you can expect to spend between $40-60 each way for the cheapest options. Ports like Tampa, Port Everglades, and Miami are just a short ride away and you can get to the port for about $10 per person. If you are driving from the port, then you don’t have to worry about paying for a ride to the ship. But you do have to pay to park your car during your stay. Parking at the port is the most convenient option, but also the most expensive. You can expect to pay between $10-$20 per day. Want to save? 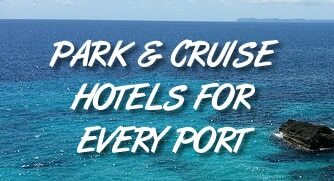 Look for independent parking lots with cheaper prices, or if staying at a hotel near the port, look for one that lets you park for free during your cruise in return for one night’s stay. Cruise fares are advertised with enticingly low headline fares. However, you will actually end up paying much more. First, that headline fare is for a single person. Right away you can double the price as cruise cabins are typically sold based on two travelers. Second, the headline rates are for interior cabins. Most people decide to upgrade to nicer cabin, increasing the price. Finally, quoted cruise fares don’t include taxes and port fees. In total, the price you actually pay can be double or triple that headline rate that’s advertised. Be sure you include the total cost of your cruise when using the calculator — not just the headline price. Our calculator automatically estimates gratuities based on the number of days and people traveling. While gratuities can vary, they usually run about $13 per person, per day. So a couple traveling together can expect to pay $26 per day, total. Unless you plan to hang out on the ship or find a beach nearby, then you’ll likely want an excursion when in port. Excursions can be fun and make a memorable experience when in port. They can also be expensive. Cheap excursions run about $50 while the most expensive can be $150 per person. If traveling with kids, their ticket is usually a little cheaper, but not by much. You can see excursions you’d like to book on your cruise line’s website to get a better idea of what you might spend on a particular outing. Drinking is a big draw on a cruise ship. There’s lots of time spent on the ship and bars are abundant. You can either purchase drinks one by one (they run about $7 for a beer and $10 for a cocktail) or you can purchase a drink package what allows you to drink what you want for one set price. If you need help on estimating what you might spend on drinks on a cruise, you can try our Drink Package Calculator here. Want to gamble on your cruise? Be prepared for some poor payouts. The casinos on a cruise ship offer all the games you’d expect, including blackjack, slots, video poker, roulette, and craps. But with a ship full of people and no other casinos around, the payouts offered aren’t that great. Still, gambling is a fun way to pass the time if you like gaming. Just budget accordingly. One of the good things about cruising is that all the food you can eat is included in the price of the cruise fare. But in the past few years the cruise lines have started to offer specialty dining as well. These are separate restaurants from the main dining room that offer things like Italian food, Mexican food, or steaks. You don’t have to eat here, but compared to the prices you’d find on land, these specialty restaurants are a deal (think $35 a person for a steakhouse meal). However, they still cost extra and you’ll want to include the cost when budgeting. There’s not much that’s more relaxing than a spa treatment, but it can be expensive on the ship. Prices vary based on deals offered during your trip and the type of treatment you choose. As a rule of thumb, don’t expect to leave the spa without spending at least $100 per person — and possibly more if you decide to get multiple treatments. What’s a vacation without souvenirs? From professional photos taken by the cruise line to cheap trinkets sold in port, there’s always an opportunity to spend money on souvenirs. And don’t forget miscellaneous things like meals in port, duty-free shopping, and more.